Annapurna Base Camp Trek begins by driving from Kathmandu to Pokhara. 7 hours, 206 km drive will reach you to the gateway of Annapurna Trekking Route, Pokhara. Pokhara is a paradise of natural attractions. Lakes, Caves, Temples, and snow-capped Annapurna Range Himalayas are the jewels of Pokhara Valley. After spending one overnight in this beautiful city, drive to Nayapul. The journey is about one hour and takes to the hiking beginning point for Annapurna Base Camp Trek. From here, everyday 5 to 6 hours adventurous walking for five days crosses the alluring small villages like Ghandruk Village, Jhinudanda, Chhomrong, Bamboo, Deurali, Machhapuchhre Base Camp, and finally, arrive at the base of Annapurna Mountains. Annapurna Base Camp is a sacred place for Gurung people inhabit in this region. They believed that the Nagas (great snake considered as a god) had left gold and numerous treasures in this area. Hindus and Buddhist believed the place as the home of many goddesses. The peak of Mount Fishtail is considered as the home of god Shiva. The daily plumes of snow were thought the smoke of his divine incense. Bringing eggs or meat is prohibited by Gurung people here. Annapurna Sanctuary lies under Annapurna Conservation Area Project (ACAP) and requires to obtain two permits. One is ACAP and another is TIMS (Trekker's Information Management System). Our Annapurna Base Camp Trek Cost includes these permits. After a live pleasing mountains views around the area and spending a day now, the trek descent back to Bamboo, Jhinu Danda (hot spring) then, to Nayapul where we take a vehicle drive back to Pokhara. The first best month of the year for Annapurna Base Camp Trek starts from March till May. Afterwards, Sep, Oct, and Nov are another favorable time to visit. During these months the weather will be clear, almost all the mountains can be observed, and the temperature will be neither too cold nor too hot. Our trekking itinerary for this trip is as follows. Day 02: Drive to Nayapul & Trek to Ghandruk. Trail Attractions: Rhododendron, Oak, and Dense Forest, Various Birds, Gurung Village, beginning views of Annapurna South, Hiun Chuli, Gangapurna, Annapurna III, and Fishtail. Day 03: Trek to Chhomrong. Trail Attractions: Kimrung Danda, Kimrong Khola, Chere Danda, and Annapurna Massif. Day 04: Trek to Bamboo. Day 05: Trek to Deurali. Day 06: Trek to Annapurna Base Camp via Machhapuchhre Base Camp. Day 07: Trek back to Bamboo. Trail Attractions: Sunrise Views over the Annapurna Massif. Day 08: Trek back to Jhinu Danda. Day 09: Trek back to Nayapul & drive back to Pokhara. Drop to your hotel. Annapurna Base Camp Trek finished here! 2 Nights hotel accommodation at Pokhara with breakfast. Pokhara Bus Station pick up and drop by private car. Pokhara to Nayapul and back by private car. An English speaking professional trekking guide. 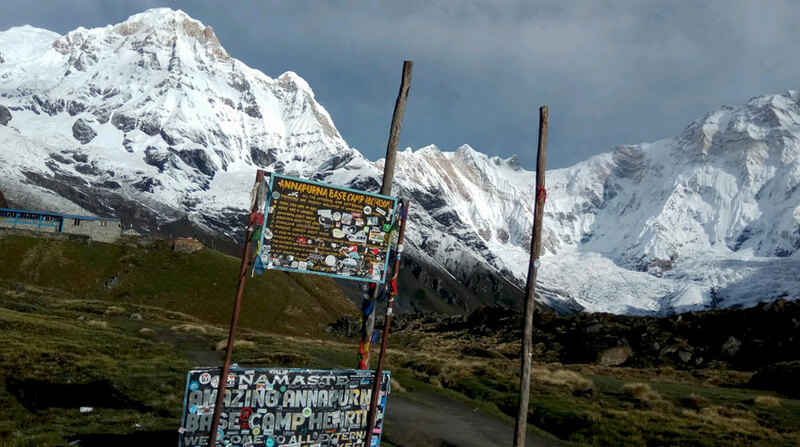 Wants some modification on Annapurna Base Camp Trek itinerary? contact us to customize it.